Part of the reason I love blogging is the lovely new people you meet and friends that you make. After chatting with our other halves at The Botanist launch, Chloe from New Girl in Toon suggested a double date. We thought this was a lovely idea but that lead to a huge problem - where to go! It's bad enough when there is just one blogger trying to decide, never mind two! After emailing back and forth for several weeks we finally settled on The Bridge Brasserie at The Vermont Hotel. Chloe has previously visited during restaurant week and for afternoon tea and was still keen to return which speaks volumes about the place. I had never set foot in the building (unless you count Martha's Bar in my younger days) but was very impressed when our taxi pulled up outside. The Vermont Hotel is my kind of hotel - they do things properly here. The door was opened for us as we entered the hotel lobby and we were directed towards The Bridge Brasserie. 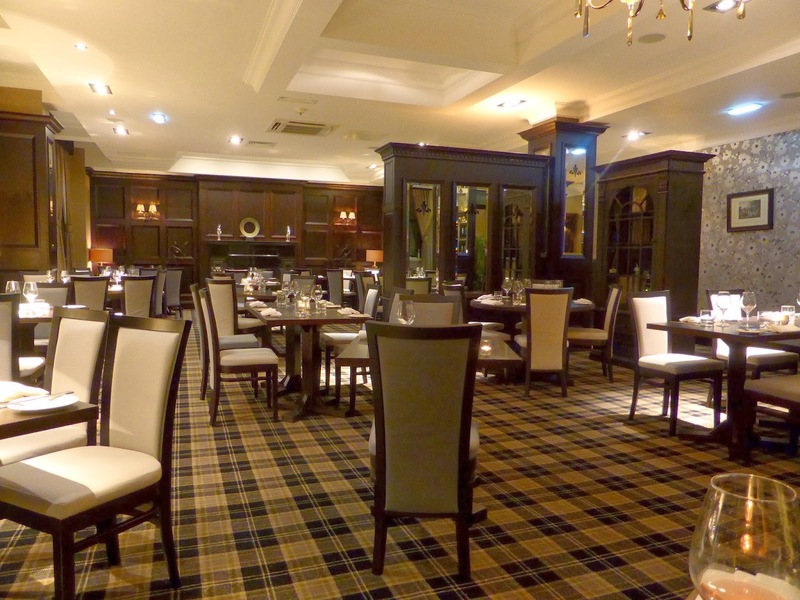 The brasserie is lovely - it has an elegant yet relaxed atmosphere and feels like somewhere special. Just look at these magnificent views! We were lucky enough to be seated near the window. Our table was most definitely the perfect spot for a date night in Newcastle (where we ended up taking about our favourite places in Newcastle). Chloe had recommended the hotel's 'Wine and Dine' deal. Three courses and a bottle of wine for two people for £59 (please note this is now £69). This proved to be excellent value - the quality of the food, service and wine were all second to none. Now I must admit to a HUGE blogging fail here - I normally take a quick snap of the menu on the night to remember the fantastic descriptions of what we've eaten - I wasn't sure if I was going to blog our meal or not (but then had to as it was just lovely) so I didn't do this! You can take my word for it though, all of our food was of the highest quality, full of flavour and beautifully presented. Service throughout our meal was discrete yet attentive. The staff were knowledgeable about their menu and confident enough to make recommendations (why can't all staff be like this!). The Vermont seems like the sort of place that will remember you if you return which is a rarity these days. We were recommended to try the Vermont's afternoon tea - Steve's ears pricked up at the mention of Gentleman's Afternoon tea (think Scotch egg, mini vermont burger, ploughmans pork pie and a pint of Wylam ale) so we will no doubt be returning sooner rather than later. Thank you to Chloe, Simon and the Vermont for a wonderful evening. Oh my. That all looks incredibly delicious... And that view! We really are lucky to live near such an incredible city with such a fantastic restaurant scene. Your images are making my mouth water! It looks absolutely incredible! Glad you had such a lovely evening!